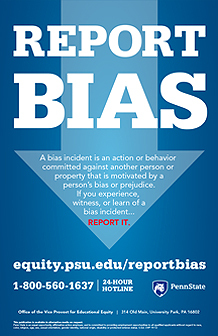 This website provides students, faculty, staff, alumni, and guests with a Penn State User ID with a web form for reporting acts of bias or intolerance that occur at Penn State. Students may use the form to report any act of intolerance they experience themselves or observe directed against anyone else. However, all other groups should only use the form to report acts they observe that are directed against students. If no student is involved, other groups should contact the Affirmative Action Office at 814-863-0471. If you or someone you know is in an emergency situation that does or could require medical, psychological or police services, please call 911 or the Penn State Police at 814-863-1111.